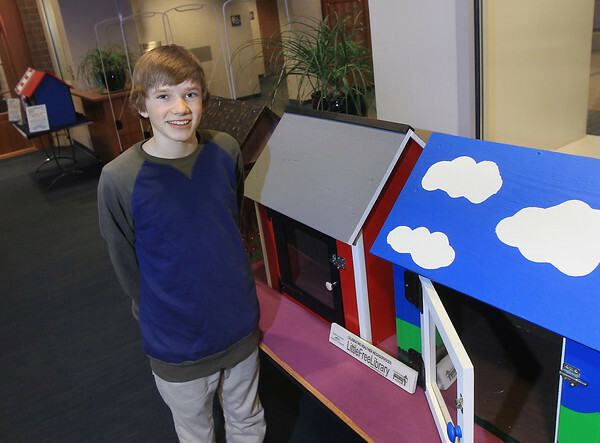 Keegan Kaipio, of Traverse City, stands Tuesday, April 9, 2013 near little free libraries that he, with help from fellow members of Boy Scouts of America Troop 35, built in collaboration with the Traverse Area District Library. The libraries are planned to be used for the Little Free Library program. The libraries will be in the Little Free Library silent auction scheduled for April 14 through April 20 with money raised benefitting the Traverse Area District Library Teen Services Summer Reading Program.